The F. A. Easton Company, already an established newsdealer in the city at the time, moved to this site at the intersection of Main and Pleasant Streets in 1893. Fergus Anzle Easton (born in Scotland in 1842) was a veteran of the Civil War, serving in the Fourth and Sixth Regiments of the New York Volunteer Infantry, primarily in Northern Virginia. Although he died in 1916, his wife reportedly continued to operate this establishment until 1965. In his book of collected essays, The Worcester Account, Samuel N. Behrman mentions Easton's as a significant part of the downtown landscape. "Saturdays and holidays there was exaltation in going ‘down the line’ . . . [past] City Hall, to Easton’s, at Main and Pleasant." No doubt a part of the attraction for Behrman and his companions was the soda fountain there which, when originally installed, was the largest in Worcester. Thanks to Larry Abramoff for the card. 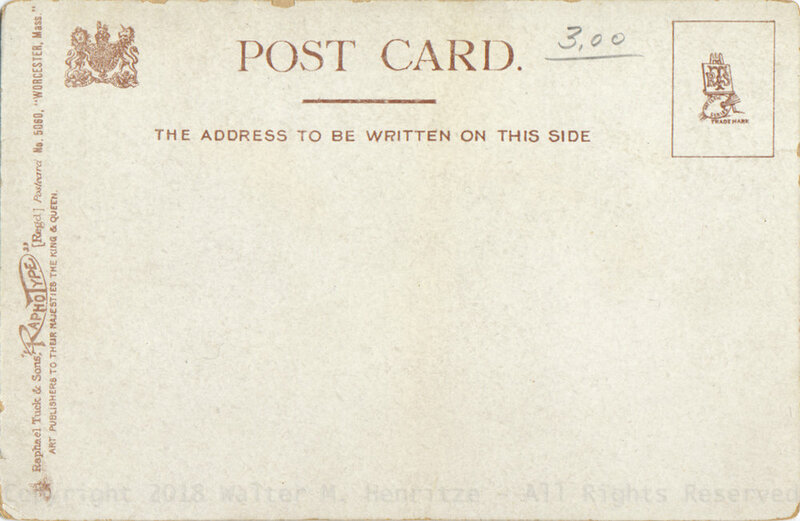 Raphael Tuck & Sons, "RaphoType" [Regd] Postcard No. 5060, "WORCESTER, Mass." Newer PostBancroft Tower - You are not forgotten. Older PostWorcester Trade School - Some verry pretty places.